Århus: KLIM HVALER PAPERBACKS, 1991. 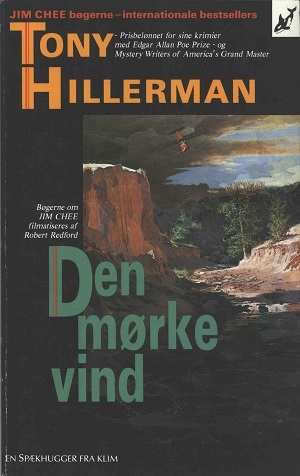 This is the second Danish edition of Tony Hillerman's 1978 international bestseller The Dark Wind, the fifth novel in his Navajo Detective series. This edition was published in paperback and the original text was translated from English to Danish by Søren K. Barsøe. The cover art is by Nils-Ole Lund and the cover layout is by Joyce Grosswiler. The cover of this Danish edition is slightly different than the 1988 version, the cover art is smaller and in the lower right hand corner. The cover publicizes that this novel has won the Edgar Allen Poe Prize and the Mystery Writers of America's Grand Master award. The cover also explains that a Jim Chee film directed by Robert Redford was based on this book. Format: Paperback, 20 x 12.5 cm. Binding: Paper cover with full-color graphics. Tony Hillerman is printed vertically in orange on the spine and below is the title is printed vertically in white followed by the publisher's logo.